“moving traffic and free exit ramps in cairo” on Thursday 10 February, by sierragoddess on flickr. (Creative Commons). 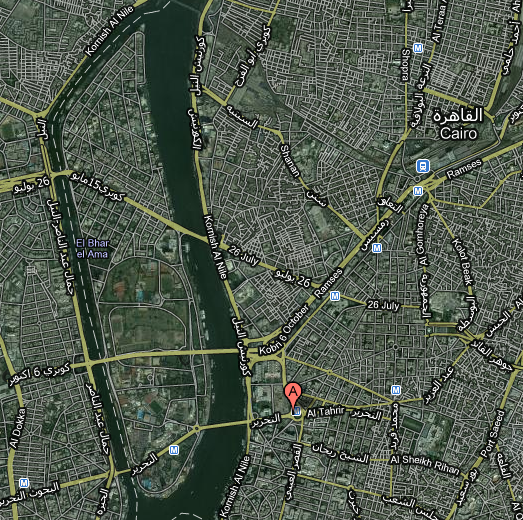 From what I can tell, it looks like this highway is the Ring Road / Mehwar Al Moneeb, south of the area on the map. “Over the lion of Kasr Al Nil bridge”, by Kodak Afga on flickr (Creative Commons). She has several other pictures of protests, some with infrastructure and landmarks. This bridge is on the map and the road it carries feeds into Tahrir Square.